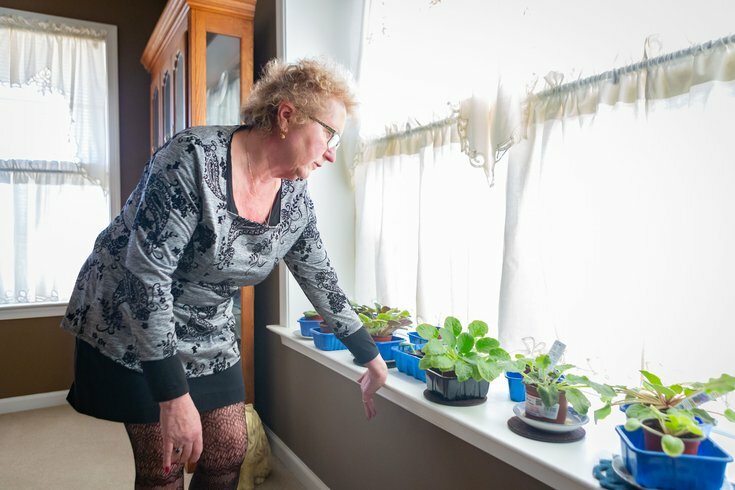 Helen Narke, 66, shows off the germinated African Violet plants she is growing on a window sill in the living room of her Schwenksville, Montgomery County home. The plants are a winter-alternative to one of her biggest hobbies, gardening, which she has enjoyed more fully since using medical marijuana to treat her neuropathy. It's caused by neuropathy – a type of nerve damage resulting from numerous conditions – that she said stems from a dental injury from several years ago. Narke has used prescription narcotics to relieve the pain, but the medications left her in daze. When she wasn't sleeping – which was often – she turned dysfunctional. In turn, she said her relationships with her immediate family devolved and her desire to live lessened. 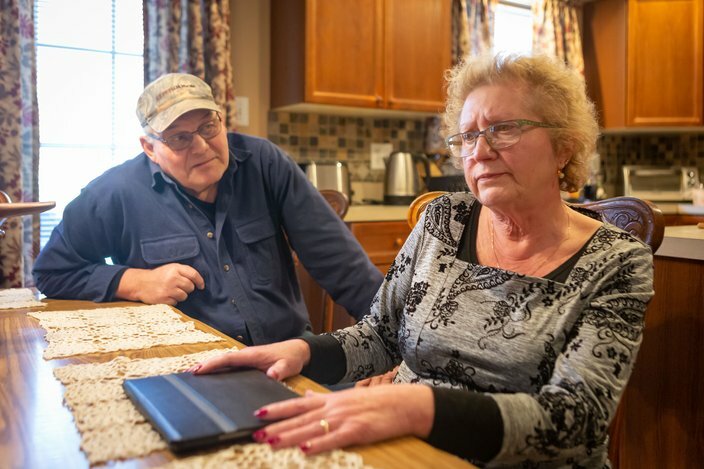 "I'm telling you, it's the worst kind of pain you can deal with," said Narke, 66, of Schwenksville, Montgomery County. "It was suicidal pain." Narke sought an alternative to remedy the pain without the side effects of the Oxycontin she had been taking. For months, she anxiously awaited the opening of Pennsylvania's first medical marijuana dispensaries. When they arrived, medical marijuana was not the immediate remedy she anticipated. But after tweaking doses and forms, Narke finally found a regimen that works for her. She credits the marijuana with restoring her life. "If I didn't use the marijuana, I probably wouldn't be here today," Narke said. "That's how serious my injury is. That's how painful living with that was. I've got it under control and I'm really happy about it." More than 2 million Americans use medical marijuana, including 87,500 Pennsylvanians and nearly 43,000 New Jersey residents. A significant chunk of them are senior citizens, like Narke. In many ways, they are now among the biggest drivers of the medical marijuana market. "The attitudes toward marijuana are changing enough that people who are living with chronic pain are often willing to try anything," said Dr. Ari Greis, director of the Medical Cannabis Department at Rothman Orthopaedic Institute. "Now that society is more open to seeing marijuana as a medication, when you look at the medical uses for marijuana, the chronic pain is definitely the most prevalent reason that people are using medical marijuana." Mark Dresnin, 71, of Philadelphia, uses medical marijuana to treat arthritis, glaucoma and muscle spasms. Younger generations hold the most favorable attitudes toward marijuana, with nearly 75 percent of millennials supporting the legalization of recreational pot. But baby boomers – the first of whom hit age 65 back in 2011 – are the biggest spenders on legal marijuana – medical and recreational. The number of boomers using marijuana of any kind increased by 25 percent in 2018, according to an annual cannabis report by Eaze.com, a cannabis delivery clearinghouse company. They outspent Generation Z – the youngest cannabis consumers – by 53 percent. Despite younger generations' greater acceptance of marijuana, boomers have played a big role in shifting attitudes. Many of them came of age during the 1960s, when public sentiment toward marijuana first began to shift. Decades later, they continue to oversee the state legislatures that have adopted medical marijuana programs. "I find that when I talk to seniors, some of them are smiling and saying, 'Yeah, little girl, I know all about this,'" said Dr. Lynn Bornfriend, a psychiatrist at the Cancer Treatment Centers of America in Philadelphia. Neither Pennsylvania nor New Jersey has released age-demographic data regarding its certified medical marijuana users, but research shows that older generations account for significant numbers of them. One study found that people age 50 and older accounted for 34.6 percent to 50.9 percent of medical marijuana users in eight states with medical cannabis programs. Another study found the same age group makes up 29.8 percent of all medi-juana users. Local dispensaries report similar findings. 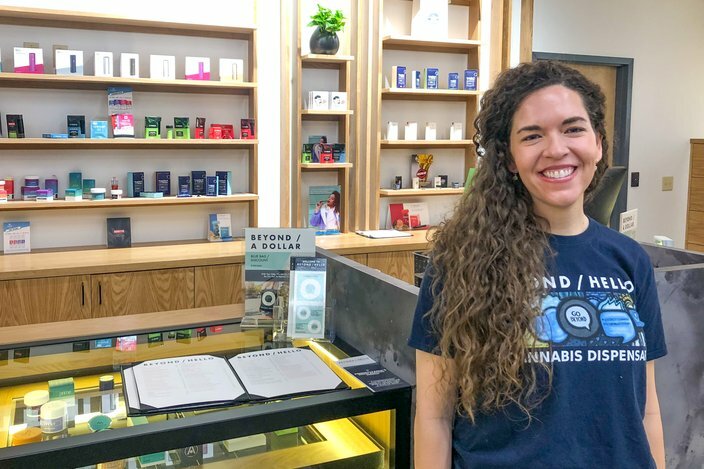 "More than 25 percent of our patient base is 60 and older, which I think squashes a lot of what people's conceptions are sometimes," said Blythe Huestis, president of Beyond/Hello, a dispensary in Center City Philadelphia. "We are seeing a larger elderly base, which is fantastic. They're getting a lot of relief." Both Pennsylvania and New Jersey allow certified patients to use medical marijuana to treat an array of conditions, including cancer, multiple sclerosis, epilepsy and chronic pain. Among the 33 states with medical marijuana programs, there are differences on who can use it. Pennsylvania's list of conditions includes autism, opioid use disorder and Parkinson's disease. New Jersey includes anxiety, migraines and Tourette syndrome. 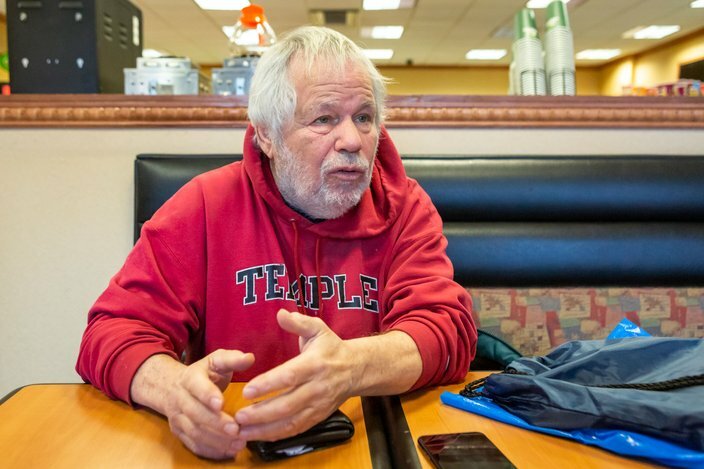 "It's the greatest thing in the world for senior citizens, just because it lasts, too," said Mark Dresnin, 71, of Philadelphia. Dresnin, a self-described former hippie, uses a variety of dry leaf marijuana products and topical creams to relieve pain caused by arthritis and glaucoma. He uses one dry leaf product, Cresco, during the day because it gives him a lift and another, Terrapin Whole Flower, at night to help fall asleep. He also uses a topical, as needed, to treat muscle spasms. "It actually takes the pain out of your muscles," Dresnin said of the cream. "You don't get high. It smells pretty, but you don't hurt. It will take it away from me, for at least a good hour. Which is relief." Dresnin previously used prescription drugs, including Percocet, Celebrex and Valium, to treat his ailments. But he found medical marijuana provided better pain relief. Still, he has one major complaint. Medical marijuana can be pricey, exceeding $100 for some products. Some dispensaries offer senior discounts, but health insurers do not cover it. "Senior citizens are on fixed incomes," Dresnin said. "They don't have it." 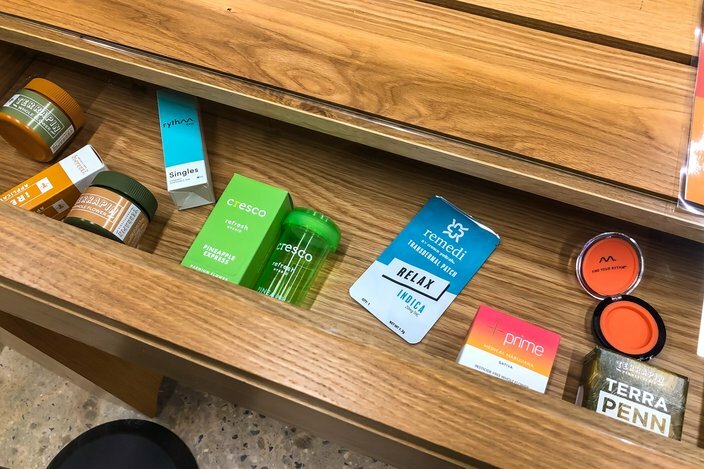 Beyond/Hello, a medical marijuana dispensary in Philadelphia, sells an assortment of products, including dry leaf products like the ones on display. But not all seniors are quick to jump on the marijuana train. And it's not just the price that holds them back. Though medical marijuana has been found to have therapeutic benefits, particularly as a pain reliever, scientific research remains fairly limited. Plus, some seniors worry about using a drug still considered illegal by the federal government. Bornfriend – who once was averse to marijuana herself – said she often meets with senior patients who express hesitancy about using medical cannabis. When her mother had cancer, Bornfriend often relates, it relieved her pain and increased her appetite. "As I tell this story about my mother and her experience, it's profound for a lot of people," Bornfriend said. "As I'm talking about her symptoms or their side effects, they're nodding and saying, 'Yes, this is what I experience.'" 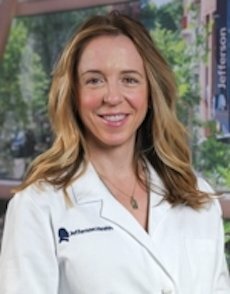 Dr. Brooke Worster runs a medical marijuana clinic at Jefferson Health. Bornfriend describes for patients the various benefits that medical marijuana can provide and details its many forms, noting differences in potency, onset times and duration. For those worried about getting high, she recommends a product with low amounts of tetrahydrocannabinol – the psychoactive compound better known as THC. "I try to cover as many possibilities as I can," Bornfriend said. While the majority of baby boomers holds favorable views of marijuana – some 54 percent support legalization of recreational marijuana – that's not the case with their elderly parents. The Silent Generation is more resistant toward marijuana. "You have to prepare people on how to use this because it's very different than if I write them a prescription for 5 milligrams of Oxycontin," she added. Her clinic, which she runs with another doctor, has certified more than 400 patients since medical marijuana became available in Pennsylvania in February 2018. About half of the patients previously have used marijuana for either medicinal or recreational purposes, Worster said. The average patient is 66 years old. Though some patients may initially express reservations about using medical marijuana, doctors said the pain sometimes becomes so unbearable that some are ready to try anything in search of relief. "By the time they're seeing me, either they've been at least willing to consider it or someone else has talked them into using it," Worster said. Last year, Worster recommended that Joan Abraham try it as a way to treat pain in her left shoulder. Abraham, 87, of Philadelphia, had her shoulder replaced in November 2017 after falling twice. She initially was prescribed a low dose of opioids to treat the pain. But side effects sent her to the hospital on multiple occasions. Worster suggested Abraham try a form of medical marijuana with high amounts of cannabidiol, the non-psychoactive compound known as CBD, and low amounts of THC. Frustrated by her pain, Abraham said she was willing to give it a shot. "This is really something new to me," Abraham said. "I'm glad to be able to take it. I'm hoping that it will really get myself back together." Abraham began vaping cannabis oil about eight months ago, using it every few hours. She gets relief from the pain, has regained weight and began to sleep better. "It's like a cigarette – you use it whenever you need it for the pain," Abraham said. "It doesn't take the pain away, but it eases it a lot." Worster said Abraham is as a "perfect example" of the way medical marijuana can benefit patients, particularly those who have struggled to find pain relief or battled the side effects of opioids and other prescription drugs. "The risk of opioids in elderly patients can be pretty surmountable," Worster said. "When people come to see me, we try to do a pretty thorough background discussion of what symptoms we're talking about. ... That should guide what I'm recommending." Blythe Huestis, president of Beyond/Hello, says nearly 25 percent of the medical marijuana dispensary's clients are age 60 or older. 'They're getting a lot of relief,' she says. Walking into a dispensary can prove overwhelming for anyone new to marijuana, regardless of age. It is sold in numerous forms – tinctures, topical creams, pills, concentrate and dry leaf – with varying levels of THC and different onset times. Oral forms, including pills, generally take longer to kick in than vape forms, which can provide relief within 5 to 10 minutes. But pills likely last longer than the effects from a vape pen. Selecting the most appropriate medical marijuana product – and determining the correct dose – can be challenging. "If they don't know exactly what to get, they can walk into a dispensary and be sold a product that has 70 or 80 percent THC, which can be pretty overwhelming from a psychoactive perspective," Worster said. The patient is free to purchase any form of medical marijuana, though Pennsylvania dispensaries are required to have pharmacists or physicians on staff to help patients find the most appropriate product and figure out a safe, but effective dose. For patients battling inflammation or a condition involving significant pain, such as neuropathy, Worster recommends products with high amounts of CBD. For patients suffering from nausea or nausea-related weight loss, she recommends products with higher amounts of THC. Generally, doctors recommend starting with low doses and gradually increasing as needed. But other approaches work better for some people. "Traditionally, pills have been a very popular form of medical marijuana, for seniors in particular," said Ryan Smith, chief operating officer of Cure Pennsylvania, which has three dispensaries. "But I talked to a senior once in Lancaster. She said to me, 'I'm so sick of taking pills. Don't give me any more pills.'" Helen Narke says using medical marijuana restored her life and improved her relationship with her husband, Ed. Before using medical marijuana to treat neuropathy, Narke used prescription narcotics that she says made her dysfunctional, hampering her relationships with Ed and their children. It took Helen Narke months to find the medical marijuana solution best for her. Initially, she said her doctor recommended she vape in addition to taking pills. But she didn't like the sensation that vaping created in her mouth – the source of her pain. And it took time to adjust to the effects of the THC. The tinkering took patience, but Narke said it paid off. Now, she takes medical marijuana capsules throughout the day – one in the morning, a second around 2 p.m. and a third before bed. "I think each person has to figure out what works for them," Narke said. "Whatever works, you stay with it. I think I've got it down pretty good right now." Narke said she does not worry about any long-term effects. And though medical marijuana is more expensive than the narcotics she was taking, she said she is fortunate she can afford it. "Last year at this time, I would be in bed crying all day, screaming with the pain," Narke said. "My husband and children couldn't tolerate it any longer." Now, she is back to gardening. She has restored relationships with her family, who had encouraged her to try cannabis. And she's enjoying retired life in her beautiful home. "It's changed my life so much," Narke said. "People who have dealt with me, like my hairdresser, have said, 'Oh my gosh Helen, you've come a long way. ... The kind of pain that I have – you can't imagine it. I would recommend this to everyone to try it at least." Wednesday: Young and old are using CBD to improve their lives: "I have never felt better since I have been on the CBD oil," says one 66-year-old proponent from Philadelphia.